Her, Him, an attic and letters from loved ones. 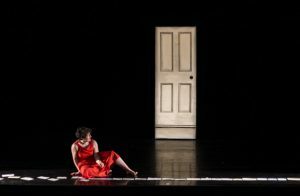 These are the basic components that make up Michelle Cahill’s Thirteen Steps to the Attic, a restrained yet evocative piece of dance theatre at this year’s Galway Theatre Festival. Using sparse props and a single door as set, Cahill fills the stage with movement and text to create a story of isolation and intimacy. Although hampered from reaching its full potential by some technical aspects, the show is a dynamic meditation on the body as the conduit of memory and how we feel our past, rather than just remember it. More so than a text-based play, the narratives of dance-theatre pieces are often subjective and left up to each audience member to decide how it ties together, so take any interpretation on my part with a grain of salt. That said, Cahill does not leave us in the dark with how to navigate Thirteen Steps. There are musings on memory and the perfect cup of tea, readings of letters by close but distant friends, reenactments of demanding and disheartening ballet classes and thoughts of Him. Directed by Rowan Tolley, the disjointed fragments of Cahill’s experience string together to form a narrative of someone who goes seeking intimacy but often finds seclusion. The repetition of musical themes and patterns of movement, coupled with Cahill’s regimented technique suggest there are rules to be followed and rituals to be be observed. Yet, at points throughout the piece, these structures warp to show the emotion behind them. One particular highlight comes as Cahill is reminded of Him and, bathed in a deep pink lighting, performs a tender, intimate dance. This tension between structure and freedom creates space for an audience to access these memories with Cahill and shows how she uses the body as a way to collect and interpret memory. At times however, I did feel I was being kept at a distance from the performance due to some technical aspects. Although the music of the piece, composed and played by Thieves of Silence, suited the tone of the show throughout, it was sometimes just too quiet and not full enough to pull me in, allowing me to focus on incidental noises being made on stage. At points when pre-recorded music was played over the speakers, this problem was negated and I felt myself falling back into the piece. Some lighting choices also broke the illusion of the show, mainly the fact the audience was often bathed in the stage lighting. I realise the size of the Nun’s Island Theatre venue may have been a factor here, but the strength of the show lies in its use of imagination in creating a captivating performance space. By bringing my focus to the audience, I was distracted and pulled out of the world being created on stage. These are minor stipulations I realise, but ones that nevertheless kept me from a sense of joyful abandon. 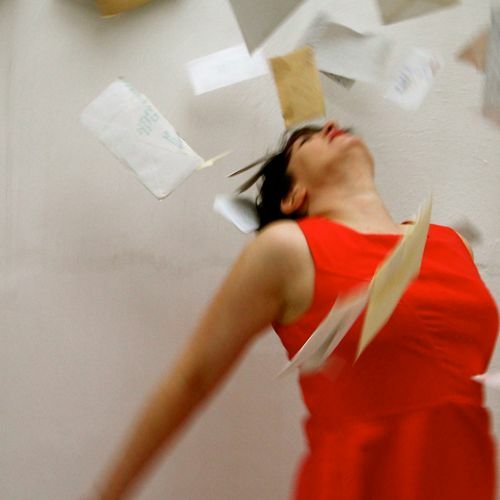 This being said, Thirteen Steps to the Attic offers an hour of something different in the Galway Theatre Festival line-up. The blending of movement and text coupled with beautiful imagery breathes space for an audience to experience something different and consider how we perceive memory and its affect on our lives. Catch this piece at Nun’s Island Theatre, 6th and 7th May at 7pm.